ï»¿ Caravan Covers : Front-only covers for use when towing. YOU MUST HAVE AN AWNING RAIL ON BOTH SIDES OF YOUR CARAVAN. PROTECTS FROM IMPACT DAMAGE AND STONE CHIPS WHILST TOWING. Use when parked too, to keep out the heat and UV. Also use in outside storage, keep the front clean. Looks silvery, technically an aluminised finish designed to keep out UV. Takes five minutes to fit or remove; held in place with adjustable straps that fit in to the awning rails. Special note about width: this is the width of the body of your caravan, not the measurement between the awning rails. Its best if you measure it yourself as any width given in a handbook will be your caravanâ€™s widest part, usually across the axle which will include the extra width of the mudguards. Its easier to measure at the rear rather than the front. 3 standard sizes from stock, all 7 feet/2.13m wide. Choices of 6 foot/1.83m drop, 7 foot/2.13m drop or 8 foot/2.44m drop. Wider standard size 7 feet 6 inches/2.29m wide with a 7 foot/2.13m drop. Other sizes made to order. All we need from you is the width of your caravan body (see note above about width); and the drop of the front cover you want. Please scroll down the page. Front covers are supplied with a storage bag. Purchase a Standard Size "Silvery (Aluminised)" Caravan Front Cover Here. Pay securely via PayPal. An account with PayPal is NOT obligatory. PayPal will send you a receipt. PayPal provides a high level of security, your details are not entered on our website. Prices include VAT and FREE UK delivery. Despatched within 2-3 working days. 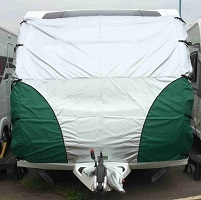 Purchase a Standard Size "Two-Tone Green or Burgundy" Caravan Front Cover Here. Buy a cover today and it should be despatched in 2-3 working days. ALTERNATIVE WAYS TO PAY . Or purchase a Tailor-made Caravan Front Cover. There are two steps to purchasing a Tailor-made Caravan Front Cover. STEP 1: Fill in the details below, so we know who you are and what size to make it! Body Width: (please see the note above about body width) . STEP 2: Pay for the cover using the PayPal button below. Have a front cover made to your specific dimensions. 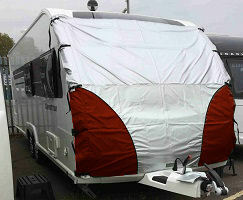 Made to measure Front caravan covers are normally supplied within 3 weeks of receiving your order. We can make a cut-out so the Front Cover drops down lower than the A frame at the sides.